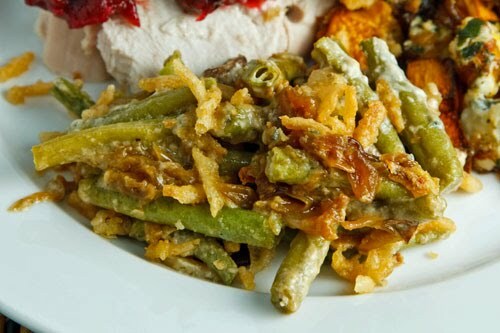 I don’t know what it is about the green bean casserole but I have been fascinated by it ever since I discovered it last year and it has quickly become a staple in my holiday meals. Of course I have always been making it from scratch and I have been experimenting with it each time I make it. This year I had a kind of blue cheese thing going on with the side dishes and I thought that a blue cheese green bean casserole would be a nice idea. Blue cheese and mushrooms are a great combination and since I like to have a strong representation of mushrooms in my green bean casserole it seemed like a natural thing to do. I pretty much just took my regular green bean casserole recipe and melted some gorgonzola dolce into the bechamel sauce . Since I also like to saute some onion along with the mushrooms and since I was going to be slowly caramelizing some onions for another dish I figured that I would just make extra and add some amazing caramelized oniony goodness to the casserole as well. I have to say that this years blue cheese green bean casserole was the best green bean casserole yet! The tangy blue cheese went well with the sweet caramelized onions and sauteed mushrooms in the creamy bechamel that covered the green beans. The crispy fried onions topped the side off perfectly adding a nice contrasting texture. Add the onions and slowly cook until they caramelize, about 20-30 minutes. Add the mushrooms and saute until the mushrooms start to caramelize, about 10-15 minutes. Add the garlic, thyme, salt and pepper and saute until fragrant, about a minute. Add the sherry and deglaze the pan. Add the green beans and saute until bright green and just starting to turn tender but still crisp, about 5 minutes. Melt the butter in a small sauce pan. Add the flour and stir until lightly golden brown. Add the milk and simmer until it thickens. Add the blue cheese and simmer until it melts. Add the green beans and mushrooms and toss to coat. Pour the mixture into an 8×8 inch baking dish. Top with the panko bread crumbs and french fried onions. Bake in a preheated 400F/200C oven until the sides are bubbling and the top is golden brown, about 5-10 minutes. Do you know that I've never had green bean casserole!?? This looks like a really neat twist on it! I've got a bunch of green beans sitting in the fridge and I've been teetering between a casserole and a warm green bean salad. This looks absolutely amazing and as I have some Gorgonzola in the fridge as well, I may try this dish tomorrow. Kevin, once again you've succeeded in putting a great twist on a classic recipe…I am not a fan of blue cheese but I may just try this! I just imported this into BigOven for me to try later. Nice spin on the traditional dish. Casseroles are a big thing, here in the Midwest, and green bean casseroles are no exception. I've been intrigued by them for a long time, too, but haven't ever made one. I really like your rendition! Oh. Yeah. I'm definitely up for this. I think my family actually gets bored with the same things year after year, so I try to change things up every year. Thanks for introducing me to a new casserole, since I'm actually cooking this year. Oh yes, baby, these beans rock!!!! I cannot wait to try them. Blue cheese is my favorite cheese!!! Very rarely (OK, never) do green beans get me salivating, but wow, these did. Great combination Kevin! An awesome casserole and perfect combo! Yummy! I have never tried bean casserole but the combination of beans and blue cheese sounds delicious! Blue cheese and I are very, very good friends. This looks amazing. Definitely making it onto my Thanksgiving list. Give me anything with blue cheese and I am happy. Great recipe! That looks great … probably too classy for my family's holiday get-togethers, though! i am pretty sure this is going to find itself on our thanksgiving table this year, wonderful recipe, thanks! Lol! Green bean casserole is such an American thing – and usually kind of a letdown to be honest. Your version looks really good! Love the addition of the blue cheese. Kevin… your creativity is working overtime and we are the benefactors. Great addition to this well-known casserole! Ok, I am drooling over here now Kevin! This sounds so, so very good! Why oh why do I only make bechamel sauce for pasta? This sounds absolutely amazing! Will have to try it. You just made my husband's thanksgiving! He loves blue cheese and this casserole! This is one fancy green bean casserole. I'm thinking I should make this for my upcoming holiday potlucks. My friends will be surprised and hopefully it will happily fill their bellies. What a way to kick up the old green bean casserole! Your casserole kicks the crap outta the "standard" one! Looks awesome! I LOVE Green Bean Casseroles. It's totally a staple for every holiday meal. Great idea to add blue cheese for a boost of flavor. my favorite food blog. not pretentious, accurate techniques and descriptions and delicious. This was pretty spectacular. I was out of blue cheese so I substituted it with Gorgonzola, and it still tasted great. Great recipe! Best Side Dish @ Thanksgiving this year!! I just made this for my office holiday potluck tomorrow. I tried some, and it is AMAZING! Thanks for the creative recipes!